The two-place T-33 jet was designed for training pilots already qualified to fly propeller-driven aircraft. It was developed from the single-seat F-80 fighter by lengthening the fuselage slightly more than three feet to accommodate a second cockpit. Originally designed the TF-80C, the T-33 made its first flight in March 1948. Production continued until August 1959 with 5,691 T-33s built. In addition to its use as a trainer, the T-33 has been used for such tasks as drone director and target towing, and in some countries even as a combat aircraft. The RT-33A version, reconnaissance aircraft produced primarily for use by foreign countries, had a camera installed in the nose and additional equipment in the rear cockpit. The T-33 is one of the world’s best known aircraft, having served with the air forces of more than 20 different countries for almost 40 years. Many are still in use throughout the world. This T-33A aircraft S/N 53-5947 on display was first flown by the 185th Fighter-Interceptor Squadron (ANG) at Will Rogers Field in Oklahoma City, OK on October 1955. 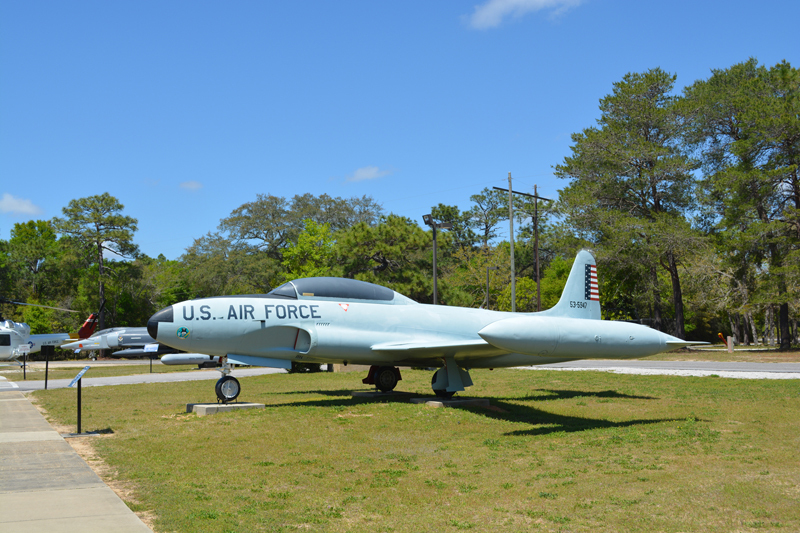 It was last flown by the 325th Fighter Weapons Wing at Tyndall AFB, FL during the 1980s.